So here we are, two souls bound by the gravity of our hearts, orbiting each other’s thoughts as the universe sets on the cosmic ocean. The universe seems to slow as we drift around the quasar, and millennia seem to pass. Stars shoot across the void, and our eyes connect. Your gaze meets mine, and we are tidally locked. I grab your hand. “I have something to show you,” I whisper. You follow me towards the constellation Cancer. And that is where I insert my foot into my mouth, because I am about as smooth as mashed potatoes. But why am I interested in the constellation Cancer? 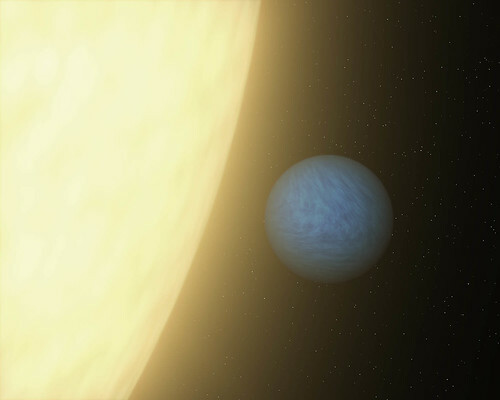 Because in 2004, astronomers discovered a planet orbiting the star 55 Cancri, a star very similar to the Sun. 55 Cancri, also known as Rho Cancri, is part of a binary star system just at the end of the ”Y” shape in Cancer, about 40 light years away. The Planet was named 55 Cancri e. Astronomers have adopted a standard in naming planets outside of our solar system that uses the host star’s name followed by a letter that corresponds to the order in which a planet was found. So 55 Cancri e is the 5th (and most recent) of the 5 planets discovered around 55 Cancri (the two stars in the binary system use a capital “A” and “B” in their names to differentiate them). 55 Cancri e is incredibly close to its star, which causes the planet’s temperatures to rise to about 9200 degrees Fahrenheit (add my smoothness and incredibly good looks and romance is in the air). How close is this planet to its host? We are talking 25 times closer than Mercury is to the Sun! Mercury‘s orbit averages 35,980,000 miles from the Sun and lasts roughly 87 days on Earth. 55 Cancri e is 3,532,320 miles from its star (more than 30,000,000 miles closer than Mercury’s orbit to the Sun), and makes a full orbit in around 18 hours. Let’s think about this for a moment. Mercury has an 87 day orbit, and 55 Cancri e has an 18 hour orbit. It takes Earth a year to orbit the Sun and 24 hours to rotate. 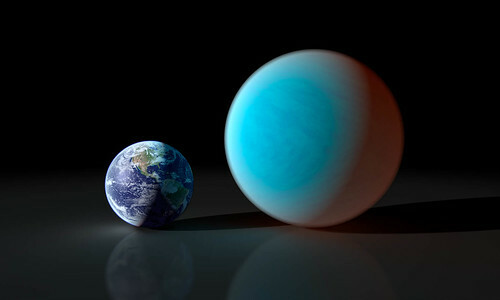 Could Cancri e’s years be shorter than its days? No – because 55 Cancri e has no days! In fact, 55 Cancri e is tidally locked with its star. Remember that hunk of rock that orbits Earth? That’s right I’m talking about you, Moon! Have you ever noticed that you always see the same face? Well the Moon is tidally locked with the Earth, so as it orbits Earth, its rotation is such that the same face is always staring right at us, watching and judging. (But let’s not confuse ourselves here – the Moon is tidally locked with the Earth, not the Sun, so it still has day and night as the Earth-Moon system orbits the Sun.) 55 Cancri e is so close to its star that the same situation is happening, and one face is getting perpetual scorching heat from the star. So half of the planet is always facing the star in a permanent day, and the other half is shrouded in perpetual darkness. Night and day changes from a reference of time… to a reference of place. What’s really exciting about this planet is that it is believed to be made mostly of diamond (and this is why I brought you here). And by mostly diamond, I mean the value of the planet has been theorized to be around $26.9 nonillion. I can hear the gears in everyone’s head grinding. A nonillion is 1,000,000,000,000,000,000,000,000,000,000 (30 zeroes). To give you a bad example of a nonillion (there aren’t any good ones), if I covered the Earth in a nonillion one dollar bills, the bills would create a layer 12 million miles thick – nearly half the distance from Earth to Venus’ orbit. The World Bank estimates the value of Earths GDP to be a meager $70 trillion (12 zeroes). To be fair, 55 Cancri e is double the radius of Earth’s 3,959 miles and is 8 times more massive, which puts 55 Cancri e in the criteria to be called a super-Earth. 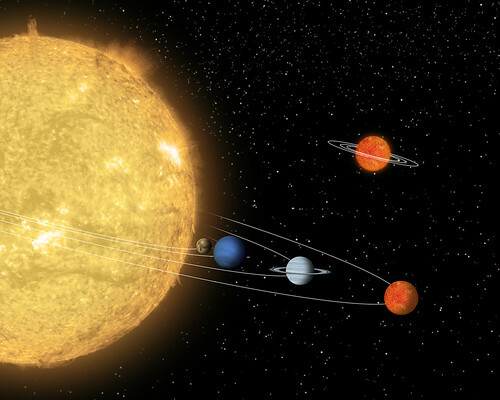 After estimating the planet’s mass and radius, and studying its host star’s composition, scientists think the rocky world is composed mainly of carbon (in the form of diamond and graphite), as well as iron, silicon carbide, and potentially silicates. Understandably, scientists are not going to these places and taking samples or pictures. How do we know what we do about this planet? Originally it was thought that 55 Cancri e had originated with a composition similar to Earth, and that being so close to its star, the immense heat and pressure caused a lot of super-critical fluids to ooze out of the nooks and crannies of the planet. Super-critical fluids behave in ways that are similar to gases and liquids. However as scientists studied the light from the host star, we’ve been able to tell that the metallicity of the star is uniquely high, meaning that there is an abundance of elements greater than helium within the star, specifically carbon. In turn, this shows that the planet is likely to be composed of carbonaceous material as well. And with the immense heat and pressure, we get the diamonds we are so fond of. But let’s not be so narrow-minded. This planet may be a very diverse system with many more things to observe and appreciate… but that is a lot of diamond. A small piece wouldn’t hurt. My imagination is proving rather fruitful as of late! Now that I am a galactic super power with more money than I can possibly fathom, let’s not overstay our welcome. Maybe we should find some place to hold out a bit, reflect on the excitement for awhile – and since we are probably wanted for interstellar robbery, perhaps somewhere like the largest void in the known universe? As always, leave a comment or two or three and we’ll see what else the universe has in store for us! Completely awesome article. I learned something new! Very cool! I enjoyed this article very much! I smiled, giggled, and hung on every word! Kudos!